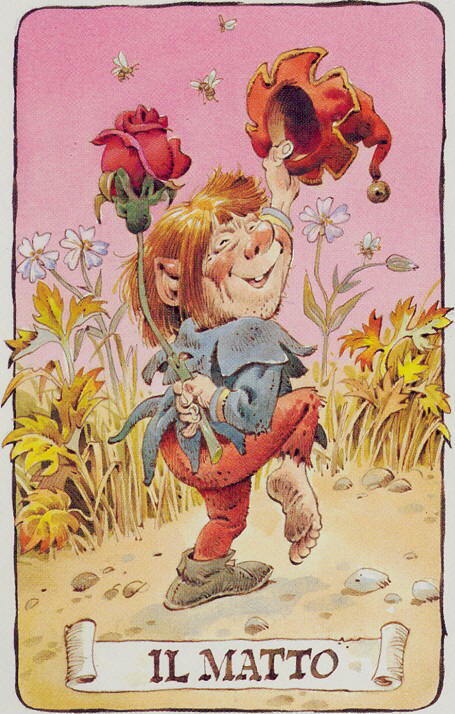 As the name suggests, the Tarot of the Gnomes is full of playful, fun Gnomes, and not the kind people put out on their front lawns. In Faery Lore, Dwarves mine for crystals and precious metals deep in the mountains. Gnomes are similar but are the care-takers of wild growing things, plants and animals. They live in extensive, tightly-knit Clans; some dwell in the great forests, some by lakes and streams or in woodland meadows; and others have now decided to move into the Gardens of humans. They are so inclined to move to these gardens to help with the growing of things, yes; but also to keep humans from overstepping their bounds! A few of the major arcana have been renamed to reflect the gnomish lifestyle: The Mad (The Fool), The Shoemaker (The Magician), and The Cart (The Chariot). The Chalices are the family of abundance. He who drinks all, will have an empty cup. The Wands are the family of diligence. The faults of the powerful become the burden of the weak. The Pentacles are the family of success. I glitter for the rich man but delude the foolish. The Swords are the family of law. I am of little value to those who know not how to use me.